Being one who survived (and still thrives) terminal Brain Cancer for 12+ years past my "expiration date," people ask me "What is the secret?" To be honest, one thing I feel that helps me is to keep my body and mind as pure as possible. Nothing and no one is perfect, yet we should do our best to help our bodies heal themselves. 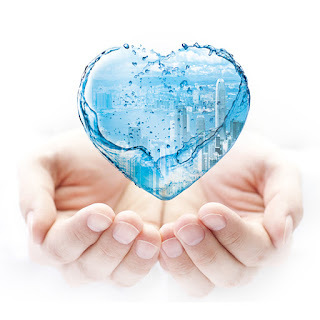 Since it is a scientific fact that our bodies are comprised of almost 75% water (in approximately the same proportion as our Earth), it makes sense (as Traditional Chinese Medicine has prescribed for more than 4,000 years) that we need to stay well hydrated with clean water to help our bodies eliminate waste and heal from any issues we are experiencing. The closer we stay to 75% (like an infant) the better our body can heal itself...this has been a key to my long-term survival. Along with many other natural methods (I plan to discuss later). According to most medical sources, humans should drink 2.7 (women) to 3.7 (men) liters of water per day. Basically drink enough water that your pee (urine) appears a pale yellow. If it often looks more like orange juice this can lead to many issues such as High Blood Pressure as your body will release the chemical vasopressin to restrict your blood vessels. Bottom-line, drink your good water people and stay healthy!! !